I did this walk on Sunday 8th August 2010 with Sara and Derek. 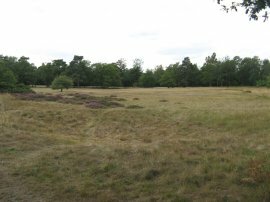 We met up at Reigate Heath before driving back over to the Haycutter pub in Broadham Green nr Oxted to resume our walk along the Greensand Way. The day started rather grey but as can be seen from the photo's it soon brightened up. 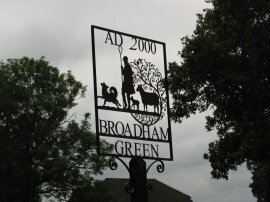 From the Haycutter, photo 1, we headed along Tanhouse Road to Broadham Green Road where the route heads briefly to the left, passing the attractive metal village sign in photo 2. The Greensand way then joins a footpath on the right that heads down between houses and onto a rather non descript path that is followed over to the village of Tandridge. Reaching the edge of the village the route joins a lane which is rather aptly called the Walk. This is followed round to reach Tandridge Lane where we headed up to the right before taking another footpath off to the left. 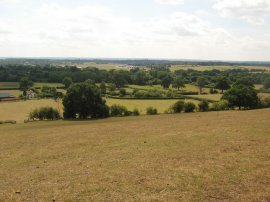 Here the views opened up a bit as we followed a field edge, photo 3, down towards the A22. Once across the road we joined a path that ran above a large pond, in fact one large enough for me to consider a small lake, which we could just about see through the trees which lined the path. The path descends gently downhill, crossing a wooden footbridge over a very shallow stream by the buildings of Leigh Mill House and passing another pond, this time on the right of the path before heading uphill along a tarmac track to join the B2236 Eastbourne Road. The route heads down the road taking the second footpath on the right however due to not paying strict attention to the map was ended up heading along the first footpath we came to. The two footpaths end up joining the Tilburstow Hill Road at almost exactly the same spot however we had a walk through the trees of Tilburstowhill Common to reach the road rather than along the correct route which appears to run through more open ground. 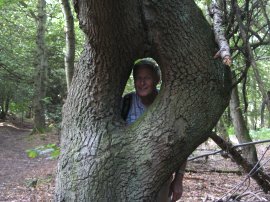 However the woodland was quite attractive, photo 4, and we also spotted a tree with a perfect hole in its trunk at roughly head height, photo 5. Crossing the road the route continues ahead through a small patch of trees before joining a field edge footpath with woodland on the right and more open views to the left, photo 6, passing through an area where the soil was much sandier in nature than previously. In the distance we could see a steady stream of planes coming in to land at Gatwick airport which was only a few miles of the south of the Greensand Ridge. This path is followed to South Park Lane where the route heads downhill before joining another footpath on the right. 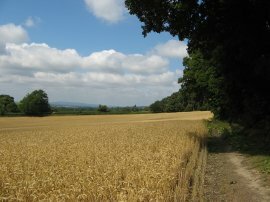 This is followed round a field edge to a driveway which leads up to Coldharbour Lane and where the lane bends to the left continues ahead along a track that runs through a narrow area of trees with fields on either side which eventually reaches Outwood Lane on the outskirts of Bletchingley. Here we headed to the right along the road for a short distance before joining another footpath on the left which continues heading more or less due west along the southern edge of the Greensand Ridge. 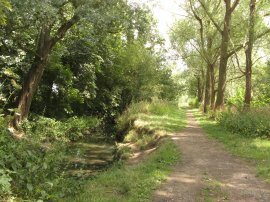 The route passes a number of houses before running along a path with trees to the right and open ground to the left, photo 7, as the route starts to approach the noisy M23 motorway. 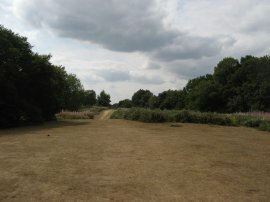 The footpath bends to the left to head downhill through an area of grazing pasture that almost looked like some old parkland with isolated trees scattered amongst the grass. The path here was quite strange being lined by the remains of an old metal fence with, in some places, two newer barbed wire fences on either side while the path is running across grassland. Later the path joins a farm track that runs past some farm building before eventually turning to the right to pass underneath the M23 motorway to reach Coopers Hill Road. Here the route turns to the right heading back uphill along a stretch of road that was really quite unpleasant to walk along, very busy with fast traffic and not much verge to walk along. Looking at the map it would be very easy to devise an alternative route at this point, crossing the M23 a bit further to the North that could avoid almost all the walk along this road. Besides the road were a number of interesting fruit trees with fruit that looked like, and probably were, small plums although I wasn't brave enough to try one to find out. 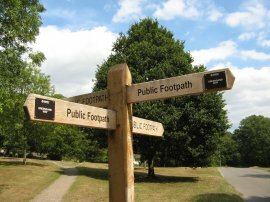 Once off the road the route joins a footpath that runs across afield and round a number of field edges to join a track which leads to the villages of South Nutfield. Here we turned to the right along Mid Street, resisting the temptation of an ice cream and the village stores, before joining another footpath on the left that heads up to another field edge path. It was now approaching 1pm and at a slightly wider area of the path we stopped for our lunch break, over looking Redhill Aerodrome and with Gatwick airport a little further away to the South. Having eaten, we continued along the path to join Sandy Lane before heading to the left and descending down Bower Hill Lane. At a crossroads the Greensand Way continues ahead along Kings Mill Lane before finally taking a footpath on the left. This was a fairly long stretch of road walking with not much of a verge which meant traffic more or less had to stop when cars were coming in both directions which was not ideal. Once off the road the route heads along side a field and over a rather overgrown drive, passing through a very small section of trees to reach a field of pasture the route heading very gently uphill before crossing over stile, one of very few we encountered on this walk, to join a path that heads down to Redhill Brook, photo 9 which somehow looks much more attractive in the photo than it did in real life. Normally it is the other way around with my photo's. We were now approaching the edges of Redhill and the brook is followed for just a short distance before we took a footpath on the left that soon led to a new housing estate on Asylum Arch Road before passing under some railway lines and following the now closed road over one of the fairways of the Redhill and Reigate Golf Course to reach the A23. Here we turned to our left before heading right along another footpath that headed through the golf course towards the Earlswood Lakes. By the lakes the route turns right, crossing one final fairway before heading through some trees up to Pendleton Road. A couple of times we had to stop for people to take their shots and almost without fail they went flying out of bounds; I hope we weren't blamed!! The route follows the footpath across the road turning right for a short distance before joining a broad fence lined footpath that runs along the backs of houses. The start of the days walk along the Greensand Way had been quite poorly signposted but this had gradually improved throughout the day and at the entrance to the footpath there was a brand new sign, photo 10, with the small rectangular signs that Surrey County Council generally use for the path. This footpath is followed to Cronks Hill Road which looked a good point for a random suburban photo. Turning to the right we followed the road round to the left to reach Cronks Hill where we turned briefly to the right again before joining a section of footpath that run through trees towards Furzefield Crescent. Crossing the green the Greensand Way continues ahead along a short stretch of path between houses before turning right and then left to reach Smoke Lane. At the end of the lane we joined a footpath on the right that runs down besides a house to join the A217 Bell Street. 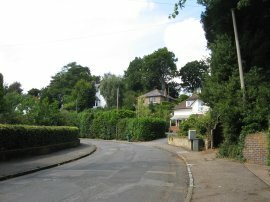 The route heads to the right along the road, crossing St Marys Road before crossing over the main road to join a footpath on the left which leads into Reigate Park. 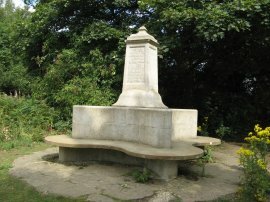 The route heads to the left, running behind houses, steadily ascending up Reigate Hill before turning to the right to reach the top of the hill by a small monument, photo 12, that commemorates the donation of the land to the town. 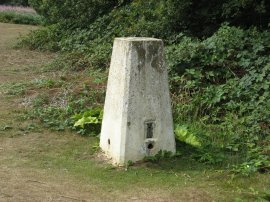 A short distance away from the monument was a trig point, S3328, photo 13. 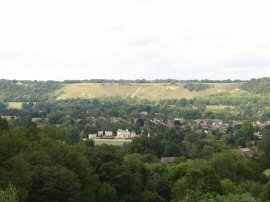 The Greensand Way heads across the narrow linear summit of the hill, photo 14, from where there we occasional views through the trees over to the North Downs, photo 15. 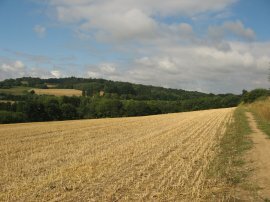 I could clearly remember walking along that section of the North Downs Way a couple of years ago and looking over towards Reigate and Redhill and even then thinking of making the return journey back along the Greensand Way. The open ground on the horizon is Colley Hill and both me and Sara remembered the Inglis Folley at the end of the hill which at this point was out of sight although it did come into view a short while later as we headed across Reigate Common. Descending quite steeply from the hill the route crosses over Park Lane and joins a farm track, Littleton Lane. This heads into a footpath that runs through a section of trees to reach the Skimmington Arms pub. 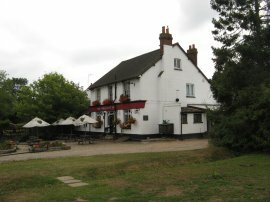 The route turns to the left and crosses in front of the pub, joining a footpath that runs behind some buildings before turning to the left to head down to Reigate Heath and the Flanchford Road. 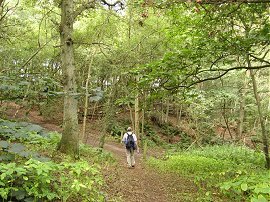 The route continues straight across the road, heading up a narrow track through the scrubby heathland towards the Windmill Church where we finished this stage of our walk along Greensand Way, photo 16. From the windmill it was just a short walk alongside the fairways of the Reigate Heath Golf Course, photo 17, which occupies this part of the heath to our parking spot. Reaching the car we had walked 14.74 miles, 14.4 of which had been along the Greensand Way. 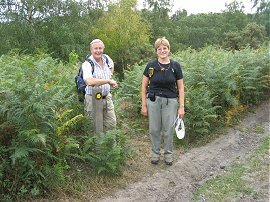 The Greensand Ridge had been less defined for much of this walk and there were a couple of not particularly friendly sections of road walking on this stage, however I still enjoyed the walk on a pleasant day with pleasant company. Finally I would like to dedicate this walk to my father who had sadly died the night before. 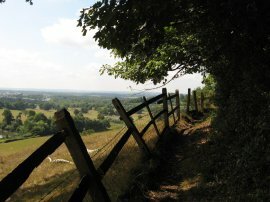 As usual I have uploaded the route of the walk which can be accessed here: Greensand Way 5 Route.